The fallout from the revelation that the U.S. National Security Agency (NSA) has collected data from American phone calls and internet activity along with the FBI continues as President Barack Obama spoke about the reports Friday. "When I came into this office, I made two commitments that are more important than any other," he said when asked to address the programs during an event on healthcare in San Jose, Calif., as reported by the Guardian. "No. 1, to keep the American people safe. And No. 2, to uphold the constitution and constitutional rights to privacy and civil liberties. "These programs are secret in the sense that they're classified. But they're not secret in the sense that - when it comes to telephone calls, every member of Congress has been briefed." As for "all these programs," the appropriate congressional committees were briefed as well. Both parties of Congress have given the programs the go-ahead, as well. "They have been authorized by bipartisan majorities repeatedly since 2006," he said. "Your duly elected representatives have been consistently informed." 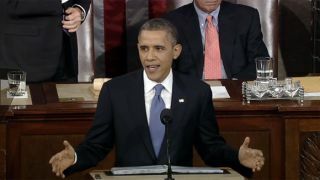 Obama then addressed each program in turn. When it comes to phone record monitoring, which reportedly uses data taken from Verizon, AT&T and Sprint, according to the Wall Street Journal, the president assured that "nobody is listening to your telephone calls." "That's not what this program's about," Obama said. "What the intelligence community is doing is identifying, looking at phone numbers and durations of calls. They are not looking at people's names, and they're not looking at content. But by sifting through this so-called metadata, they may find potential leads with respect to folks who might engage in terrorism." Do you feel better, citizens? He said federal judge approval is needed to actually listen to a phone call. As for oversight, both Congress and a special Foreign Intelligence Surveillance Act (FISA) court look over the program, Obama said. As for PRISM, which reportedly allows for federal access to the central servers of companies like Apple, Google, Facebook and Yahoo, Obama said the program doesn't apply to U.S. citizens or those living in the U.S.
"Not only is Congress fully apprised of it, but what is also true is that the FISA court has to authorize it. What you have is two programs that were originally authorized by Congress, have been repeatedly authorized...Congress is continuously briefed. There are whole layers of safeguards involved. "We've also set up an audit process...after the fact, making absolutely certain that all the safeguards are being properly observed. "We'll have to discuss and debate how we're keeping this balance. Because there are some tradeoffs involved." Obama said he welcomes debate on the programs and issues involved. The president said that he had "healthy skepticism" about the programs when he first heard about them, but after evaluation and expanding oversight, his assessment is that the programs "help us prevent terrorist attacks." "I think it's important to recognize you can't have 100 percent security and also 100 percent privacy, and also zero inconvenience," he added. "We're going to have to make some choices as a society." As for the leaks that led to the NSA and FBI program revelations, Obama was less amicable. "I don't welcome leaks, because there's a reason why these programs are classified," he said. I think there's a suggestion that somehow, any classified program is a quote-unquote secret program, that means it's somehow suspicious." Publicizing programs like Prism lets "people who are trying to do us harm" in on the programs that are put in place to prevent those acts, the president continued. Congress and the courts are sufficient safeguards to abuses, the president reasoned. U.S. Senator Rand Paul plans to introduce a bill today - titled the Fourth Amendment Restoration Act of 2013 - that would require a warrant based on probably cause to search American phone records. For more coverage, read on about the U.K. gov. 's alleged Prism usage, what internet companies say about their participation and whether Prism is something to fear.